In addition to world-class clinical training and an amazing group of colleagues, UVA offers unique educational opportunities outside of traditional graduate medical education that help set us apart. The residency training program at UVA is uniquely designed to allow each of its housestaff to pursue their own unique interests and to receive world-class training and mentored support. As you will see, UVA offers a wide array of special training tracks that allow residents to personalize their experience and education to prepare for their future training and careers. Additionally, the supportive environment and size of UVA’s program allows you to become known and to connect with mentors to foster your development. One of the enduring aspects of UVA’s training program is the resident-intern team structure. 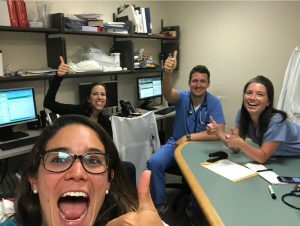 On the wards and in the ICUs, each UVA intern is paired with either a PGY2 or PGY3 resident to make a resident team. This structure provides outstanding support for new interns as well as the flexibility for interns to take on more responsibility as they become more comfortable and effective as physicians. This system provides the graded autonomy that is important in residency training and provides the space and structure for PGY2 and PGY3 residents to grow as teachers. The one exception to the 1:1 is the new structure of 1 resident:2 interns on our General Medicine 5 Central team. This new rotation gives residents the opportunity to practice a more managerial role. Intern caps are decreased from 10 to 7 in this model, to still allow for adequate time for teaching and growth. UVA’s training program has long been known as a resident-run program. Many of the curricular changes and innovations that take place at UVA were thought of, or contributed to, by housestaff. Residents have a regular voice in discussions about the program and contribute on committees throughout the department and the hospital. The culture of patient care at UVA is also resident-centered: residents lead rounds, teach on the wards, initiate QI projects themselves and provide the physician contribution to multidisciplinary inpatient rounds. New in 2018, the program features a resident-led Resident Wellness Committee, focusing on improving resident life inside and outside the hospital. UVA has an extremely active Program Evaluation Committee, staffed by residents from each class along with faculty, that provides input on areas for improvement each year in the program. A balanced exposure to patients and disease pathology is vital in internal medicine training as is the opportunity to develop as a professional within a community of learners and practitioners. UVA is fortunate to be able to provide this balanced exposure to patient care and training without having to send its residents to other hospitals. Our geographic location as a public university medical center in a populous state provides a large patient base including primary care, provided to both local patients as well as underserved patients from throughout the state, as well as highly specialized tertiary care. Since our residents can receive this full spectrum of patient exposure without rotating at other hospitals, they are able to attend the same didactic conferences and have more access to their research and career mentors as well as to their peers. UVA’s residency program transitioned to a block schedule in 2014, utilizing a 3+1 schedule in which housestaff rotate through an inpatient ward/ICU rotation or through an elective each three week block followed by an ambulatory week. On this ambulatory week, both interns and residents have a half day of dedicated didactic time as well as an administrative half day. Clinical time on the +1 week consists of some continuity clinic sessions as well as some sessions in an ambulatory elective setting; this setting is repeated for three months to provide a critical mass of exposure to that elective. Additionally, PGY2 and PGY3 residents are able to do research in a longitudinal elective format during the +1 week to allow for flexibility in the research experience. These curricular changes have been well-received by the residents and provided more space and energy to focus on the ambulatory side of residency training as well as more continuity while on inpatient rotations. Residents learn primary care through their continuity clinic experience at University Medical Associates (UMA), an on-site primary care clinic serving patients both local and from afar. Residents are assigned the patient panel of an outgoing resident and they maintain that panel through residency. This panel of patients has been longitudinally supervised by the resident’s “firm attending” who has the experience of knowing those patients over time and provides consistency in resident teaching and feedback as they are a resident’s most frequent preceptor at UMA. One of the most valuable aspects of the size of UVA’s training program and remaining at one hospital is the convenience of finding mentorship. UVA residents arrive with an assigned mentor, their CORE advisor, who is familiar with the program and its faculty. This program mentor will assist residents throughout their residency in evaluating clinical training progress, setting personal goals, and making career decisions in addition to finding research mentorship. Incoming interns are also paired with a volunteer resident mentor – their “Big Sib”. Subspecialty mentorship is plentiful throughout all three years. UVA has one of the longest-running Primary Care tracks in the country, providing residents a balanced training experience with additional ambulatory time and didactics as well as dedicated mentorship while still receiving the inpatient training and broad elective exposure to pursue subspecialty training. The Global Health Leadership track provides our residents a tremendous opportunity to practice medicine throughout the world and to engage in teaching, research or policy activities around global health. The Clinical Investigator track provides one PGY2 resident each year a department-funded master’s degree in clinical investigation as well as longitudinal research time in order to prepare for an academic career involving clinical research. Newer tracks added in 2016, the Clinical Educator track and the Hospitalist track, provide even more avenues for residents to gain additional experience and mentorship to jumpstart their intended careers post-residency. UVA is set in the picturesque college town of Charlottesville, Virginia, in the foothills of the Blue Ridge Mountains. Charlottesville is consistently listed as one of the top places to live in the country. Residents have the opportunity to grow in their practice of medicine in a setting that is convenient and allows for a variety of pursuits outside of the hospital. A healthy incorporation of work and life together is important to our residents and to the program.